The countertop soda maker jumped on another strong earnings report as shares have now more than doubled for the year. Shares of do-it-yourself soda maker SodaStream International Ltd. (NASDAQ:SODA) were soaring last month, up 41% according to data from S&P Global Market Intelligence. The stock jumped on a strong third-quarter earnings report and continued to gain as it feuded with the bottled-water industry after releasing an attack on its waste. The maker of the countertop soda system blew past estimates in its quarterly report. Revenue rose 13% to $124.2 million, topping expectations of $117.7 million, while earnings per share more than tripled from $0.22 to $0.69, crushing the consensus at $0.24. The company's brand revamp as a sparkling water company appears to be taking hold as CEO Daniel Birnbaum called the results "very strong" and noted record high operating income in the quarter. Starter kit sales jumped 23%, evidence that the marketing shift is drawing new customers, and sales increased in all four of the company's geographic regions. The company also reported an all-time record sales of gas refills at 7.7 million, up 9% from the year before. Shares jumped 16% on the report and continued to gain through the month as optimism built. The company fought a cease-and-desist letter from the International Bottled Water Association, ordering it to take down an ad campaign, and the media attention could provide an additional spotlight for SodaStream. 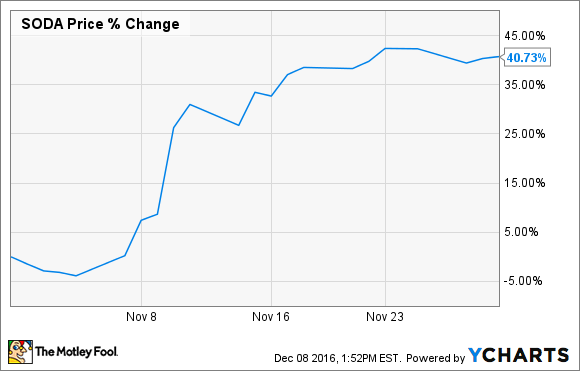 The stock continued to climb into December and is now up 137% this year. SodaStream did not provide guidance for the current period, but the company has easily beaten estimates in all three of its earnings reports this year, a sign that Wall Street continues to underestimate it. Analysts lifted their fourth-quarter and 2017 estimates after the report, but expectations still look modest for the current quarter at $0.30, just 25% better than the year before. The third quarter is seasonally the company's strongest. SodaStream's operating model and ability to control costs has allowed it to turn a moderate increase in revenue into blockbuster profit growth. That means the company should be able to overcome the 10% EPS increase analysts are forecasting for next year as well. After the stock cratered in 2014-2015, SodaStream needs to show that the revamped business can deliver steady growth, but it should be able to top Wall Street's low expectations.